Now that I have Failed, What is Next? We have all failed at something in our lives, perhaps many times. There is such pressure for us to “succeed” that we often ‘fail’ to realize there are some benefits to failing. Some people are so fearful of failing that they simply will not try a different course of action; will not take a calculated risk; will not attempt something new. Many people are plagued by something the experts have called, ‘Atychiphobia’. Atychiphobia is the abnormal, unwarranted and persistent fear of failure. However, you don’t have to suffer from Atychiphobia, as this is a choice. The fear of failing is an obsession that develops in the subconscious mind. It has been transported into a person’s mind by some distress or traumatic situation. This has caused the person fail to see any options to move forward. Therefore, they lose confidence. They fear making decisions. They see little or no hope of ever succeeding. To this I desire to encourage you today. Did you know that some very famous and highly successful had failed frequently in their road to success? 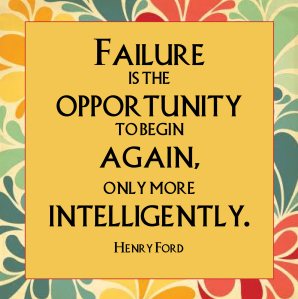 This should encourage you to realize that we can benefit from what the world calls failure. Thomas Edison ‘failed’ over 10,000 times before he successfully invented the light bulb. Babe Ruth, who held both the single season and career home-run records also ‘failed’ 1,330 times by striking out! Michael Jordan said, “I’ve missed more than 9000 shots in my career. I’ve lost almost 300 games. 26 times, I’ve been trusted to take the game winning shot and missed. I’ve failed over and over and over again in my life. And that is why I succeed.” In spite of all his failings, he is still considered to be the best basketball player of all time by many people. Abraham Lincoln, the sixteenth President of the United States failed in many endeavors during his life. Abraham Lincoln Simply Refused To Quit! Probably the greatest example of persistence is Abraham Lincoln. Born into poverty, Lincoln was faced with defeat throughout his life. He lost eight elections, twice failed in business and suffered a nervous breakdown. He could have quit many times – but he didn’t and because he didn’t quit, he became one of the greatest presidents in the history of our country. 1816 His family was forced out of their home. He had to work to support them. 1832 Ran for state legislature – lost. 1832 Also lost his job – wanted to go to law school but couldn’t get in. 1833 Borrowed some money from a friend to begin a business and by the end of the year he was bankrupt. He spent the next 17 years of his life paying off this debt. 1834 Ran for state legislature again – won. 1835 Was engaged to be married, sweetheart died and his heart was broken. 1836 Had a total nervous breakdown and was in bed for six months. 1838 Sought to become speaker of the state legislature – defeated. 1840 Sought to become elector – defeated. 1843 Ran for Congress – lost. 1846 Ran for Congress again – this time he won – went to Washington and did a good job. 1848 Ran for re-election to Congress – lost. 1854 Ran for Senate of the United States – lost. 1856 Sought the Vice-Presidential nomination at his party’s national convention – get less than 100 votes. 1858 Ran for U.S. Senate again – again he lost. 1860 Elected president of the United States. Please understand that I am dealing with a wide range of failings. Therefore, I am going to write a series of articles on various ‘failings.’ My thesis is simple: How can we come back after a ‘failing’ and ensure that we will do a better job the next time? What safeguards can we put into place to prevent this from happening again? What can we learn to make us wiser, better, stronger? How can I be restored to a place of usefulness and productivity for God after a failing? · Sometimes we must actually fail in order to succeed. This will be a separate article. · To a great degree, how we deal with our present failings will determine our future success. A person that achieves any measure of success understands that a person may fail without ever being a failure. Failings are often the steps upon which one must climb in order to bring the previously hidden knowledge into their lives. It was Albert Einstein who said, “Insanity consists of doing the same thing over and over and hoping for different results.” One of the most treasured characteristics we have is the ability to learn how to evaluate our experiences. Simply failing brings no value into our lives. However, successfully evaluating our experiences will add enormous value to our lives. During the teaching in this series I will teach the process that I use to evaluate my experiences, in anticipation that it will add value to your life as it has mine. · One only becomes a failure when they make the failing the final chapter in their book of life. It was Dr. Jack Hyles, who shared a great Biblical principle when he said that a person could “Fail without being a Failure.” This is what we will be writing about in future articles.